The the health and economic of serious mental illness (SMI) is often overlooked by the health policy and some provider communities. One key question is how how can we quantify the economic burden of SMI. Further, how can we reduce this burden. Much of my research has looked at how medications can improve health and reduce health care costs for patients with SMI (here, here, and here). We estimated that the per patient lifetime burden of SMI is $1.85 million. 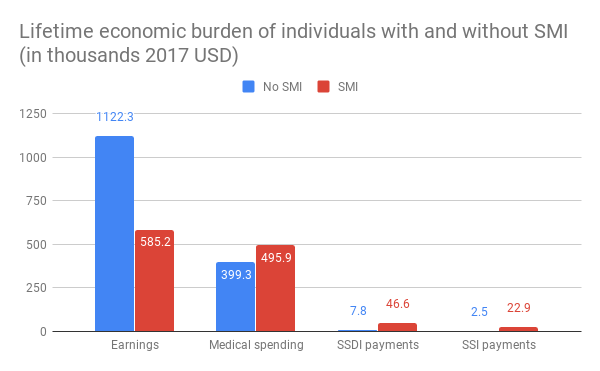 We also found that a policy intervention focused on improving the educational attainment of people with SMI reduces the average per person burden of SMI by $73,600 (4.0 percent)—a change driven primarily by higher lifetime earnings—or over $8.9 billion in reduced burden per cohort of SMI patients. There are different health insurance plans which cover many things related to medical costs. The lifetime costs of serious mental illness may be high and not be affordable by everyone. So, choose the plan from varies health insurance plans as Mutual of Omaha supplement, AARP Medicare supplement plan G https://www.thehealthexchangeagency.com/aarp-unitedhealthcare-plan-g/ and more from The Health Exchange Agency. Mental illness is just the state of mind of the person; but when that state of mind is not very stable then the consequences are fatal as the person is not able to control the mind or its actions due to various reasons, well the point here is that people who are close to the one who is mentally ill suffers in terms of medical expenses and to prevent that a insurance is helpful but still there are many who are not even able to afford an insurance. In situations like these it is better to try out organic remedy rather by taking costly medicines; among many organic products one is Shilajit, and it contains great healing power as it is used in many ways.